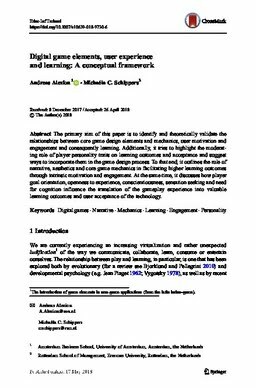 The primary aim of this paper is to identify and theoretically validate the relationships between core game design elements and mechanics, user motivation and engagement and consequently learning. Additionally, it tries to highlight the moderating role of player personality traits on learning outcomes and acceptance and suggest ways to incorporate them in the game design process. To that end, it outlines the role of narrative, aesthetics and core game mechanics in facilitating higher learning outcomes through intrinsic motivation and engagement. At the same time, it discusses how player goal orientation, openness to experience, conscientiousness, sensation seeking and need for cognition influence the translation of the gameplay experience into valuable learning outcomes and user acceptance of the technology.